Expertly crafted from volcanic grass, this woven design is as durable as it is beautiful. In the volcanic foothills of Bali, Indonesia, artisans gather sturdy "ata" grass and carry it to their workspace for weaving. 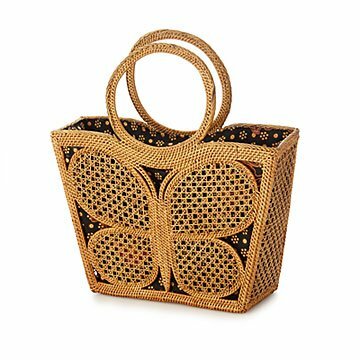 The result is this intricate bag with a subtle butterfly design stitched into either side. Finished with colorful variations of fabric lining, the piece is as beautiful as it is durable. It also makes a unique gift for fashionable friends who cherish their one-of-a-kind designs. Handmade in Bali. Wipe clean with a soft cloth, do not submerge in water.